Limited liability companies do not contain a termination date unless the operating agreement or certificate of incorporation so provides. The members in many states can include a specific term as part of the certificate of formation but apparently did not do so in this case. The minority brother, meanwhile, argued that unanimous consent of the members was required. Because the operating agreement provided for a specific date of dissolution, he contended, any change in that date constituted an amendment to the operating agreement. Both parties moved for summary judgment. The Court drew the distinction between the Certificate of Formation, which puts the world on notice that the company is operating as an LLC, and the operating agreement, which defines the relationships between the parties. The legislature had not specifically provided that the continuation of a limited liability company beyond its expiration date would require a unanimous vote, so the Court turned to the language of the operating agreement. The Court reasoned that the statute specifies the decisions that must be made by a majority and those for which a simple majority is sufficient, and held that it did not resolve the dispute. Applying the terms of the operating agreement, the court reasoned, there was no indication that a unanimous vote was required. The minority brother also argued that he was now bound to his brothers for as long as they continued to extend the life of the company, since there was no way for him to retrieve his investment. The court did not reach the issue of what might be a reasonable remedy for that complaint, if any, because it was not adequately preserved below. The result might have been different under some other statutes. The Revised Uniform Limited Liability Company Act, as adopted in New Jersey, requires unanimous consent for acts “outside the ordinary course of the company’s activities.” N.J.S.A. 42:2C-37. See Model Act § 40(c)(3)(A). Under New York and Delaware law, meanwhile, permit a dissolution or merger of an entity by a simple majority, but are silent about acts outside ordinary realm of the company’s operations and do not contain language that would appear to prevent a similar result. 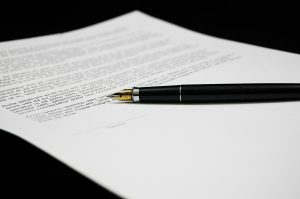 Of court the members of a limited liability company can agree on any procedures for dissolution, or for continuing the limited liability company.